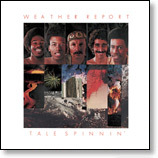 I recently saw a CD of Weather Report’s Tale Spinnin’ up for auction on ebay for the bargain basement price of–get this–only $90.50. (Wonder how they determined to thrown in that fifty cents on the minimum bid.) Granted, it was the 2002 Sony Legacy Recordings reissue with improved sound and all, but alas, there were no bidders. That version of Tale Spinnin’ was part of a Sony reissue program under the direction of Bob Belden which also included Mysterious Traveller and Black Market. All three were remastered and included new liner notes by jazz historian Hal Miller. I’m not sure how many copies of Tale Spinnin’ Legacy made, but by 2008 it was out of print. So I am happy to report that Sony licensed a new reissue to Iconoclassic Records. It hit store shelves last month, and has the same great sound as the 2002 Sony reissue, but with new 1,300-word liner notes by yours truly, based on interviews with Wayne Shorter, Ndugu Chancler and Alphonso Johnson. Now, if you already own a copy of Tale Spinnin’, then you probably don’t need to buy this one, too, unless you yearn to read the new, never-before-published comments by Wayne, Ndugu and Alphonso about the making of the album. But if you don’t already own it, you can go straight to the Iconoclassics web site and pick it up for a lot less than $90.50. :-) Iconoclassic did a very nice job on the packaging. And those new liner notes are pretty cool, too.